Samuel Adams is the flagship brand of the Boston Beer Company. The brand name (often shortened to Sam Adams) was chosen in honor of Founding Father Samuel Adams. Adams inherited his father's brewery on King Street (modern day State Street). Some histories say he was a brewer, while others describe him as a maltster. The Samuel Adams brewery is located in Boston, Massachusetts, United States, where visitors can take a tour, and shop beers and merchandise. Samuel Adams beer is brewed by the Boston Beer Company, which was founded by Jim Koch and Rhonda Kallman. Samuel Adams beer was started using a recipe now known as the Samuel Adams Boston Lager. Following Jim Koch’s great-great grandfather’s recipe, Samuel Adams continued to use traditional brewing processes, including decoction mash (a four vessel process) and krausening (a secondary fermentation). Boston Lager is also dry hopped using the Hallertau Mittelfrueh and Tettnang Tettnanger hops. In addition to year-round offerings, Samuel Adams also has offerings for each season. The winter seasonal beer is Cold Snap, a Witbier. The spring seasonal beer is the Escape Route, a Kölsch. The spring seasonals are sold from January to March. The Summer offerings are available from April through August, and include Summer Ale, a wheat ale; and Porch Rocker, a radler. The Autumn seasonal beers are available August through October and include Octoberfest, a Marzen; and Pumpkin Batch, a saison. The Winter/Holiday seasonal beers are available November through December and include Winter Lager, a bock; and White Christmas, a spiced ale. Samuel Adams also offers seasonal variety packs which include a mix of year-round and seasonal offerings. First brewed in 2014, Samuel Adams Rebel IPA is a West Coast style India Pale Ale. The beer is brewed with five American hops - American Cascade, Simcoe, Chinook, Centennial, and Amarillo. In early 2015, Samuel Adams released Rebel Rouser, a double India Pale Ale, and Rebel Rider, a session India Pale Ale. There are five flavor options in the Rebel Family; Rebel Juiced IPA, Rebel Grapefruit IPA, Rebel Rouser IPA, Rebel Cascade IPA, and Rebel Raw IPA. Introduced in 2001 Sam Adams Light was the second light beer the company brewed. The company previously sold Boston Lightship which was introduced in 1993. These Belgian style beers are left in large wood barrels to age and pick up some of the flavors of the wood. The beers in this collection include American Kriek, New World, Stony Brook Red, Thirteenth Hour and Tetravis. There are currently nine brews of this variant available: Fresh as Helles, Ella Blanc IPL, Noble Pils, Winter Lager, White Christmas, Octoberfest, Cold Snap, Summer Ale, and Porch Rocker. Originally brewed in a nano brewery in 2014, the Nitro Project is a collection of two styles that are infused with nitrogen gas in the carbonation process. The two brews are Nitro Coffee Stout and Nitro White Ale. There was also a third style, Nitro IPA, which is not currently brewed. In a Boston Globe article, Jim Koch describes the process of infusing the nitrogen as "difficult". Released in 2018. Sam ‘76 is brewed using both Lager and Ale hops to make a beer like no other. It’s comes in at 4.7%. It has a tropical taste and aroma and has a refreshing feel. 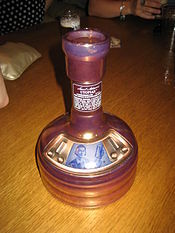 In 2002 the company released Utopias; at 24% abv, it was marketed as the strongest commercial beer in the world (a mark that has since been challenged). The company subsequently released new "vintages" of Utopias annually, increasing the alcoholic content to 27% abv by 2007. Utopias is made with caramel, Vienna, Moravian and Bavarian smoked malts, and four varieties of noble hops: Hallertauer Mittelfrüh, Tettnanger, Spalter, and Saaz hops. The beer is matured in scotch, cognac and port barrels for the better part of a year. A limited number of bottles are released each year; in 2007, only 12,000 bottles were produced, and in 2009, only 9,000 bottles were released. Sold in a ceramic bottle resembling a copper-finished brewing kettle, a single bottle of Utopias cost $100 in 2002, and $150 in 2009. Because of legal restrictions, Utopias is not offered in the states of Alabama, Georgia, Idaho, New Hampshire, North Carolina, Oregon, South Carolina, Vermont, or West Virginia. Starting in the 2018 season, Boston Beer Company's Samuel Adams became the official beer of the Boston Red Sox replacing Budweiser. The eight-year deal will last through the 2025 season and include signage and a Sam roof deck. The agreement also allows Boston Beer to use the Red Sox Logo for marketing purposes, run Red Sox related contests with tickets to games. Samuel Adams beer has gained attention in the media for its various beers. In a list of "Best Christmas/Winter Beer in Each State", Samuel Adams' Fezziwig brew won in the state of Massachusetts. Additionally, Samuel Adams brewery itself was named the best brewery in all of Massachusetts according to a Yelp-based Buzzed article. ^ Most historical evidence suggests that Adams worked as a maltster and not a brewer; Stanley Baron, Brewed in America: The History of Beer and Ale in the United States (Boston: Little, Brown, 1962), pp. 74–75. However, Ira Stoll in Samuel Adams: A Life (New York: Free Press, 2008; ISBN 978-0-7432-9911-4; ISBN 0-7432-9911-6), p. 275n16, notes that James Koch, founder of the Boston Beer Company, reports having seen a receipt for hops signed by Adams, which indicates that Adams may have done some brewing. ^ "Boston Brewery | Brewery Tours". www.samueladams.com. Retrieved 2017-02-17. ^ "BBC History". The Boston Beer Company. Archived from the original on 10 November 2006. Retrieved 24 January 2017. ^ "Samuel Adams Boston Lager". SamuelAdams.com. November 19, 2014. Retrieved 2014-11-11. ^ a b "Our Beers, Seasonals". Samuel Adams. Retrieved March 3, 2016. ^ Jason Notte (May 27, 2015). "7 Craft Beer Variety Packs to Drink Until Labor Day". Market Watch. Retrieved March 3, 2016. ^ "Samuel Adams Rebel IPA". SamuelAdams.com. November 19, 2014. Retrieved 2014-11-11. ^ "Sam Adams Light". SamuelAdams.com. November 19, 2014. Retrieved 2014-11-11. ^ "Barrel Room Collection". SamuelAdams.com. November 19, 2014. Retrieved 2014-11-11. ^ Nason, Adam (July 20, 2012). "Samuel Adams Barrel Room Collection National Rollout Begins". Beer Pulse. Retrieved March 1, 2016. ^ "Our Beers". Samuel Adams. ^ Dzen, Gary. "Nitrogen brings a new element to Sam Adams beer". Boston Globe. ^ "The 48 proof beer". Beer Break Vol. 2, No. 19. Real Beer Media, Inc. 2002-02-14. Retrieved 2007-07-22. ^ DellaSala, Steve (2007-01-31). "Sam Adams Utopias - Strongest Beer in the World". Audioholics. Retrieved 2007-07-22. ^ "Samuel Adams – America's World Class Beer". Boston Beer Company. Retrieved 2009-02-02. ^ Adams, Don (2017-12-12). "So long, Bud — Sam Adams is the new official beer of the Red Sox". The Boston Globe. Retrieved 2017-12-13. ^ "The Boston Brewery". Samuel Adams. Retrieved 7 April 2017. ^ "Boston Brewery | Brewery Tours". Samuel Adams. Retrieved 7 April 2017. ^ Vorel, Jim. "104 of the Best Christmas/Winter Beers, Blind-Tasted and Ranked". Paste Magazine. Retrieved 24 January 2017. ^ No, Michelle. "The Best Brewery In Every State, According To Yelp". Buzzfeed. Retrieved 24 January 2017. Probable author, 1768–1769 "Journal of Occurrences"
Co-author, 1775 "Letter to the inhabitants of Canada"
This page was last edited on 4 April 2019, at 03:03 (UTC).